I got hit HARD by Fusarium wilt on my melons. While planning my 2019 gardening schedule I was planning on direct seeding my melons but then got the idea that it might be worth trialing grafting my desired variety onto fusarium wilt resistant rootstock. Anyone have any experience with this? Calling @ross because I know he has plans to go all out on growing melons next year. That’s one method people use. Another is heating the soil to kill the disease. I’d also be interested to hear if anyone has first hand experience using rootstock. Going to be ordering very soon. If anyone wants to participate in a community trial I can send you some seeds as long as you post your grafting results here. Still need to figure out how I will run this trial as I only have space for 3-5 upright trellised melons depending on how aggressively I train/prune them. Lot of info from forum members here. As a side note, does anyone know what the terminology is for finding cucumbers that continue to fruit on their existing stems versus ones that only fruit at the tips? I grow mine vertically and prune them back heavily mid-late season but last year I learned that some varieties only fruit on the tips. The plants get infected by the beetles on the tops, I’m not sure if the disease then moves to the roots where a better stock would help or not. That is the method I use, I did learn it from this video. I do find that the tinfoil can cut into the tender stem so I switched to teflon tape. 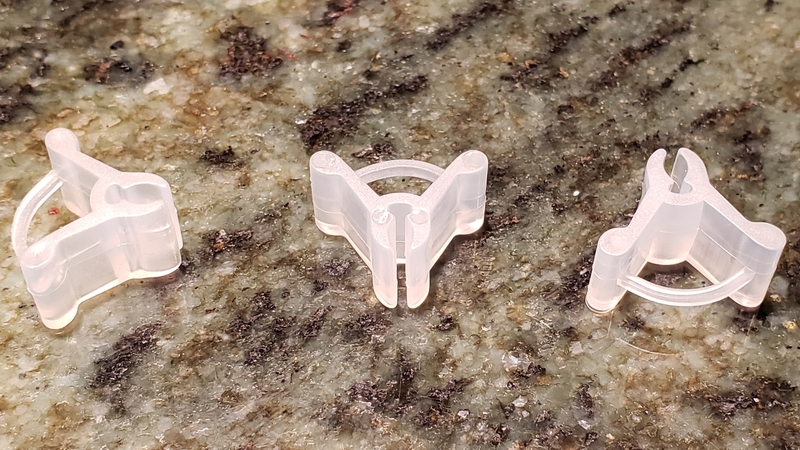 I got a bag of 100 silicone clips for $7. They look like they will work well but only for stems 2-3mm thick. Ill be starting my melon seeds in a few more weeks so should be able to report how they work out then. I would love to see pictures. It looks like you are talking about two different diseases. Bacteria wilt is carried by the cucumber beetle but Fusarium wilt isn’t. Fusarium wilt is a soil borne fungus so heating the soil can be helpful. Bacteria wilt as the name implies is a bacteria and I’m not aware of any benefit in heating the soil. The only thing I know of that will keep your cucurbits from contracting it is keeping the beetles off of your plants. Oops right… just saw the “wilt”. I have only had problems with bacterial wilt, never fusarium wilt. I just measured and I think they are ideal for 2.5 to 4.5 mm stems. Being made out of silicone I though they would have a weak grip but they are actually pretty strong. Generally, I would agree with you, however, with bacterial wilt my understanding is that the bacteria reproduce so much inside the xylem vessels completely blocking them, and thus shutting down nutrients and water transport from the roots to shoots. It is more of a physical effect rather than interfering with some biochemical process, so not sure how a different rootstock would help. Anyhow, I am an experimentalist by profession, so would certainly give it a try, but this year I don’t have space for extra plants. So, will probably try this in 2020, which will also allow me to learn from your experience.